Things to do at Sabuj Bon: The Ajoy river offers a delightful backdrop to this Sabuj Bon, admired with amazing greeneries. You can explore this whole region of undulating landscape. Try to recognize the huge varieties of trees and flower in the region. Some notable trees are Nolinas, Cycus, Edenium, Mili, Obesum, Bogenvelia and Panthapadap. How to reach Sabuj Bon: Sabuj Bon is not located very close to Vishwa Bharati. You need to travel from Bolpur (Shantiniketan) station towards Vishwa Bharati by car. Take the first right turn and after crossing the railway track, drive for 12.5 kilometers to locate Sabuj Bon. 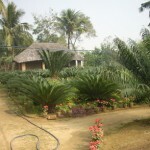 Best time to visit Sabuj Bon: Sabuj Bon, boasting of its exotic greeneries, welcomes tourists all through the year. However, the best time to visit is the rainy season. Lodging & Dining facilities at Sabuj Bon: Small huts with thatched roofs have been built in this plantation museum using bamboo and clay, offering accommodation facilities. There are also provisions of huts equipped with air condition where as huts with simple fans are also provided. The bathrooms are also furnished with modern facilities. There is also a provision of an open-air dining room in the area, admired with seating arrangements made of bamboo and tiles. Some exclusive photos of Sabujban, Bolpur. SABUJ BON: THINK TWICE BEFORE YOU BOOK! On the way from Burdwan-Gushkara after you cross the bridge over Ajay River, you have to take a turn to right. Sabuj Bon is 12 km from that turning.. At first entry you are impressed with the greenery. On a pre-ordered food you are served with cold rice and tasteless frozen fish for which they charge Rs 120/- per meal. Then you walk amidst to your cottages. The caretaker named Firdous starts selling you dreams, of bullock carts, pure ghee etc. When you have reached the thatched cottages (Rs700/- to Rs 1000/-) per night it impresses you further. Cottages amidst nature!!! Aha! This is the place to be on a holiday. Alas…..when you enter you get SHOCK for the money you paid!! Two basic beds, a roof of straws without even a brick structure, the taps leaking, mirror over-turned,, bathroom flooded with water. Some vital taps missing!!! You think is this why I paid thousand bucks for a night!!!! Nighmare is yet to come…..If you are hungry at tea-time or otherwise, no food is available in between.They have 13 cottages and three people (they will tell you 50 people, another lie) manning the area. No service is available. Once you are dumped in your room and business money recovered, you will hardly find anyone there to attend you. On asking why room s are in such pathetic condition, you are told, nothing can be done. There are no people to go to Bolpur. When you ask the caretaker Firdous he starts blabbering a bunch of lies…….8 years since it is formed, dreams are being sold, yet in 8 years no improvement to the quality of rooms or service! All they are keen on business at a price which will provide below standard service!!! Before you jump and book…..think twice!! You have wasted your money and fun too!!! Are you prepared for such holiday at such a price?